Mass media registration number № ФС 77 – 67563, d/d October 31st, 2016 (Roskomnadzor – Federal Service for Supervision of Communications, Information Technology, and Mass Media). 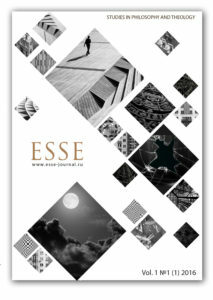 The scholarly journal “ESSE: Studies in Philosophy and Theology” is an independent networked peer-reviewed periodical. The journal is issued biannually, all the materials being subject to peer review and expert examination. 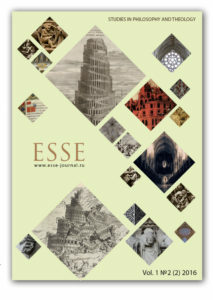 The journal “ESSE: Studies in Philosophy and Theology” publishes original research works in history of philosophy and theology, state-of-the-art papers on philosophical and theological issues, translations of ancient and contemporary authors, various reviews including book reviews. The principal language of publication is Russian. The editorial policy as stated on the journal website allows publishing materials both in PDF files with consecutive pagination and as web-pages in the HTML format. The objective of the journal consists in shaping and maintaining a common ground of communication between philosophers and theologians, first of all between authors doing research in history of philosophy and theology.